Just wanted to alliviate any stress you were all still having. The crisis is over. There is no more panic, no more fear, the box with the MODA fabric is HERE. OK, it doesn't sound like much in the face of hurricanes, (I will get to that in a minute), but new fabric from moda was lost in the madness of Hurricane Ike. It was horrible. Janice and I were freaking out. Well, I was freaking out, Janice has a much more positive take on life than I do. She was sure it would come. Anyway, Janice had mailed me a priority box on Wednesday, Sept. 9. It always takes two days, but because of the hurricane, my post office, 20 miles from Galveston, closed on Thursday and Friday and Saturday. No box. Why you ask all the fuss over a box. Chez Moi and Basic Gray fabrics. Yards of Fabric. After the storm, I made 2 trips to the post office 30 miles away, three phone calls and I stood at the mailbox every day for a week. I left town, no box. 8 days after it should have arrived, the box came. 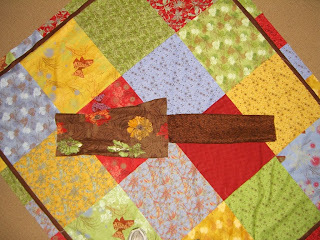 Inside, the fabric to finish this quilt and make two more. Yes, on the floor in this picture is the beginning of one of our Basic Gray quilts. I can't wait to get back home and start sewing. Back to the Hurricane. 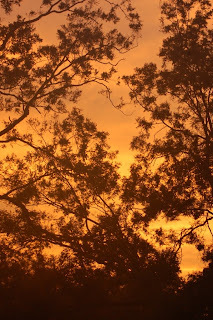 This was the sunset after a day of storms. We survived. Some roof tiles blew off the house, tree branches broke, and no power for four days. I went a tota l of 26 days without power four years ago from hurricanes in Orlando. Back to Hurricane Ike, apparantly it went zooming northward and knocked the power out at Janice's daughters in Columbus, Ohio. Then Janice found out it went through their property in Missouri. Janice left on Thursday for an emergency road trip to Missouri to check out the damage. I left very early Friday morning to drive to Lake Powell in Utah and then to Ogden, Utah for the Utah Quilter's Guild festival. We are working while on the road, and will both be back home this week. 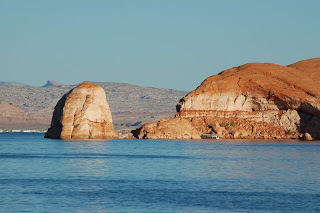 My trip included dropping a boat off at Lake Powell in Southern Utah. 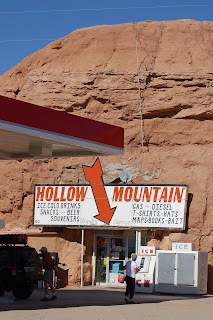 I posted a couple of pictures from southern Utah. One on the water and one from a little town called Hanksville. Funny thing, we don't have rocks in Florida. We don't even have stones or pebbles. Have a great week. Thanks for reading. I usually try to write on Sundays, but the storm is really coming. 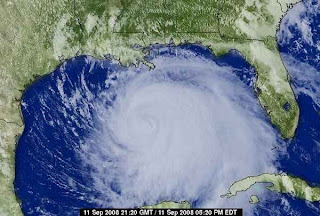 Yes, Hurricane Ike is supposed to go right over my house early Saturday Morning. We should have sustained winds over 100 miles an hour for 5 to 8 hours. The power will go out and they have said it may be two weeks before it is back on. Here is a picture of the storm from Thursday. New fabric was arriving today from Moda. Some of it was to finish up a quilt made with one of their new lines, BASIC GRAY. We actually will have two new designs for the line. 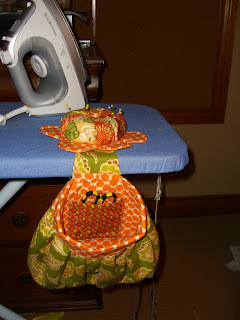 There is also fabric for a design using Chez Moi. Unfortunately, because of the pending storm, the mail, ups, fedex and all those other companies decided not to make deliveries. I thought postmen came rain or shine. Hopefully next week. It is also difficult to sew without power. Janice will have to work overtime. The good news, Janice has two quilts ready to go on the long arm quilting machine this week. Here is a picture of my favorite, just the top. We promised sneak peaks. As always, we would love to hear what you think. Have a great week. Check back often. We have lots of new projects. Another week, another tropical storm passing by and a hurricane on the way. I figure with Janice in Florida and me in Texas, we got this whole storm thing covered. One or the other of us will be effected. 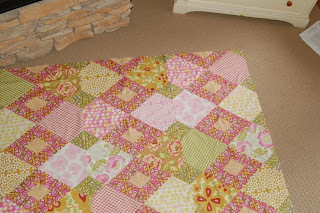 As I am writing this, there is a beautiful quilt top sitting on my floor. I think this one is my favorite so far. It should be ready for quilting tomorrow. It will make it's grand debut here on the blog first. Speaking of debuts, I am putting on a couple of pictures of our newest creation. 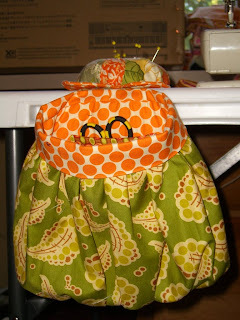 The pattern isn't written yet, give us a couple of weeks, but our "Abbey Bag" is going to be a hit. I almost forgot the BIG NEWS. Janice and I are officially going to Market. Yes, we are having a booth in Houston. We should have 6 to 8 new patterns. Yes, that means we are working like crazy right now. It will get even worse in a couple of weeks, when all the new fabric comes in. 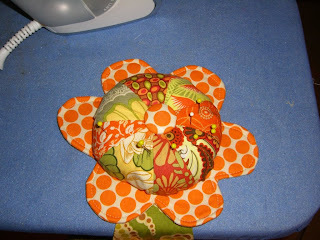 This is the Pin Cushion. That's about it for this week. LET US KNOW WHAT YOU THINK OF THE ''ABBEY BAG."